Our purpose is to provide uninterrupted web services with low cost in OPENSTACK. 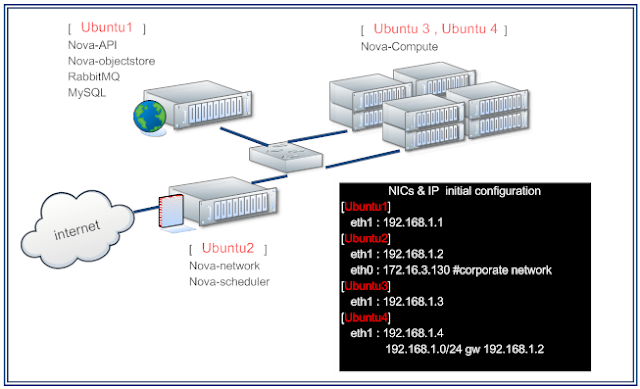 Due to all instances traffic through Nova-Network host in a basic deployment of NOVA . And it's hard to do HA+LB for Nova-Network. As I know it will be very hard to implement. After read "Bootstrapping OpenStack Clouds" doc writed by DELL....The fault zone concept it much easier and cheaper. I.Two zones topology , share nothing between each zones. But combine two instance network in same network segment. Zone1 using 192.168.1.0/25, Zone2 using 192.168.1.128/25 . We do not using floating ip. Let instance route from Core Network Switch directly. I'm using WinXP b32 Eng.